Our recent travels took us on a vacation to Paris, Madrid, and London. We were so excited about the trip to Europe, anxiously anticipating it for a couple months after we purchased the tickets. Looking on paper, to some Paris was to be the highlight of the trip but considering me and my wife being huge foodies I was most excited about Madrid’s food culture. I heard mixed opinions from friends and co-workers that have visited both cities and surprisingly the census was that Madrid had the edge as far as food. The overall reason for this is that the food was more authentic, and made with so much passion and love that gave it the slight edge over Parisian cuisines. But I know all too well that everyone’s food pallet is not quite the same. Already super excited about all that comes with Paris, I figured if we find some amazing restaurants, Paris would by far be our best destination visited yet. To make a long story short, Paris wasn’t necessarily what I hoped for prior to the trip regarding food, but had some pretty decent food. One particular place that had amazing food, but I will tell you about it in another post so look out for it. Now we fast forward to Madrid and a restaurant that blew me away, and according to me (maybe not my wife) was hands down the BEST food of the entire trip. 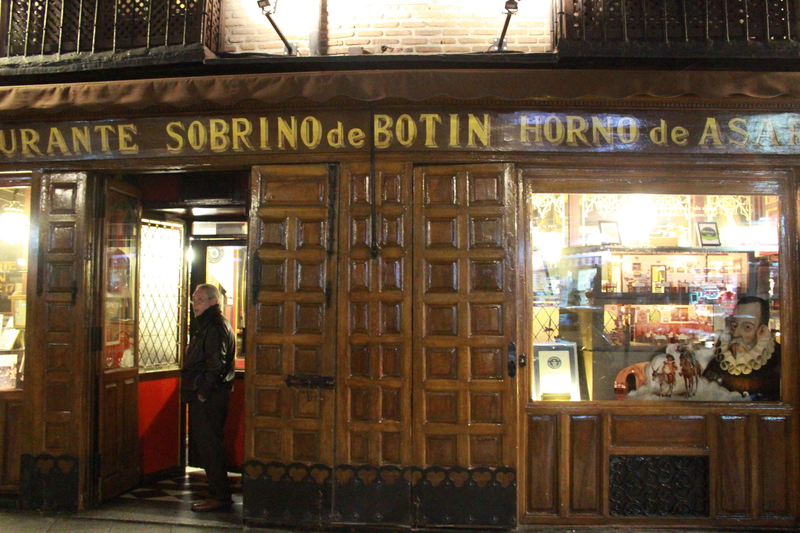 The restaurant I speak of is Sobrino de Botin located on Calle de Cucherilleros, 17 Madrid, Spain. Even before you enter the restaurant the history alone draws major interest. 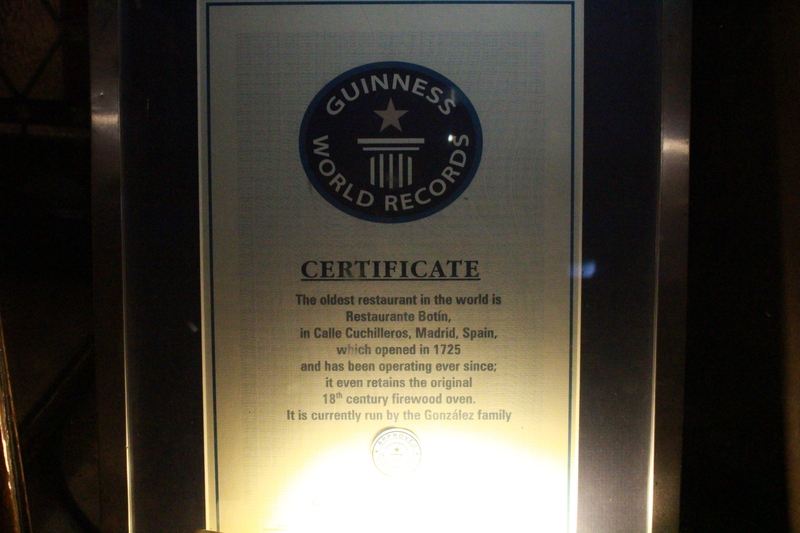 According to the Guinness Book of World Records, Sobrino de Botin is the oldest restaurant in the world, opening its doors in (get this) 1725! This restaurant has been in business for a staggering 290 years, not closing for business one day since they opened. In doing research about what restaurants to dine, this one immediately shot to the top of our list simply for that reason, not even concerned about how the food might taste. But it’s safe to say an establishment being opened that long, food might be pretty decent. We made sure to make reservations weeks in advance so that we didn’t miss out on eating there. We visited the oldest post office in the world during a quick trip to Philadelphia last year, so thought it might be pretty cool to add on another “OLDEST” place to our resume. As you enter the restaurant you can feel the ambiance immediately. The host is very welcoming and the restaurant poses so much charm. Probably a residence at one point, the lay out is that of an old house, so you feel like you’re dining in someone’s grandmothers home. Sobrino is a Michelin Star restaurant as well to add even more intrigue to how the experience will be. We were immediately seated on the second level of the restaurant. The dining area was beautiful. Cozy not small, gave you just enough room to be comfortable. Our server was wonderful, he has been with the restaurant for nearly 30 years as a server and it showed, his service was impeccable! We didn’t have to ask for anything because he was right on top of everything, but still gave us space to enjoy ourselves and gawk at the fact that we were literally sitting in a restaurant over 200 years old. Now comes the food. The menu was as expected, 2 pages only and al a carte style. 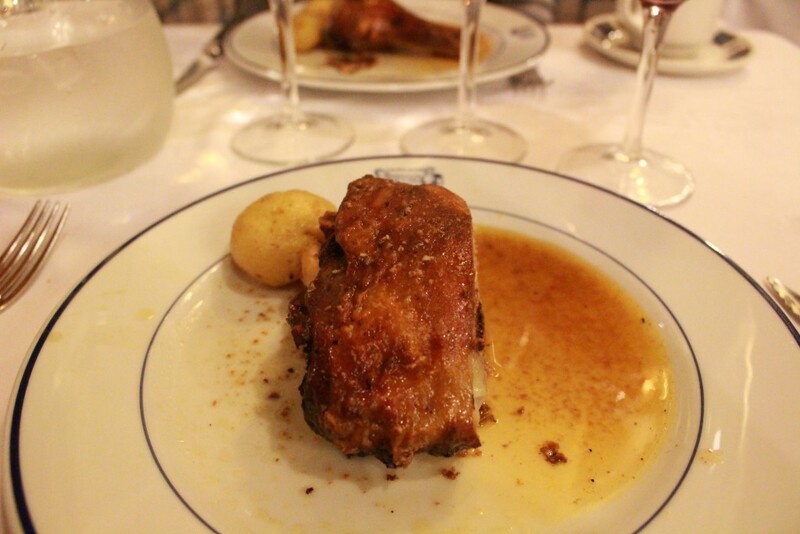 Almost every review we read beforehand raved about the Roasted Suckling Pig entrée that is a specialty of Botin. However, my wife wasn’t too fond of that idea so we went with another specialty item, the Roasted Baby Lamb (Great choice)! To accompany the lamb dish we got a side of green beans w/Iberian Ham and hands down THE BEST green beans on earth! The preparation of the lamb was pure perfection. 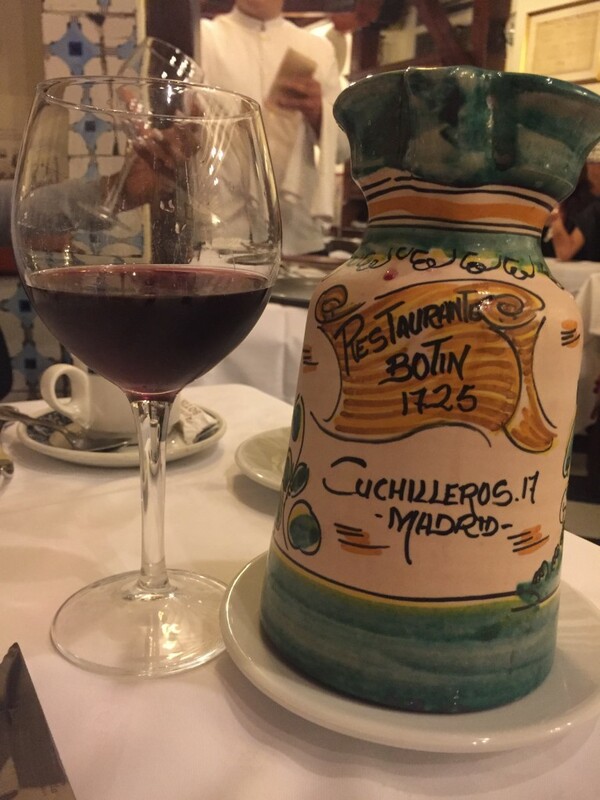 Botin is still one of the only restaurants that still uses the original wood oven from some 200 years ago and you absolutely taste the difference when you take your first bite. The combination of the lamb and green beans literally made my night. To only enhance the dining experience, I ordered a half pitcher of Red Sangria for a very overpriced (7,60 Euro lol). When I looked at the prices of the menu items for a restaurant of that caliber, I knew I was going to have the best dinner. With Madrid being the originators of the popular drink, that’s all I drank the entire time I was in Madrid. The great blend of the red wine, fruit, sweetener and brandy was unmatched by any Sangria I’ve experienced in the states. Too full for dessert, we had to call it a night even though the dessert menu look amazing as well and judging by the food and drink we already consumed, I know it would be just as good. This restaurant is now in the top 5 of my all-time favorites easily and I recommend anyone having the pleasure to visit the great city of Madrid to make a b-line for Sobrino de Botin, you won’t regret it! The prices are unbeatable for a Michelin Star dining experience and the food is immaculate. Sounds amazing. My husband and I have been dying to get to Spain. Will definitely have to check this restaurant out when we do go. Tamara, thanks for your comment and YES, when you visit Madrid Botin is a must! Amazing food, atmosphere and staff. You will enjoy!